A transit is an essential tool of the survey trade; It's basically a short-range telescope that sits on a tripod, and it's used to measure changes in elevation between two points. When I was in high school 20+ years ago, the transits we used looked a bit like nautical sextents from the late 19th century. But today I spotted a high-tech Leica TCRA1201 transit in use in downtown San Francisco. The technology sure has evolved a lot since the mid-1980s! Apart from it's spiffy control panel, this one even has Bluetooth. I love D&R. Thanks for making such an interesting and varied blog. I saw your post on the Leica "transit" and felt compelled, as a surveyor, to pick a nit. That instrument is actually a "total station" which is a hybrid of a transit and an electronic distance meter. Back in the day, you had to have separate instruments to measure angles (transit) and distance (surveyor's chain and ultimately the laser range finder). 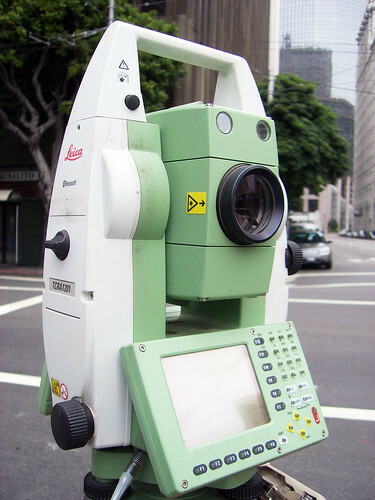 Now those two functions are combined in a single instrument, the total station. Also, I really adored the epic of the construction of the chicken shed. And "shackitecture" is my new favorite word.